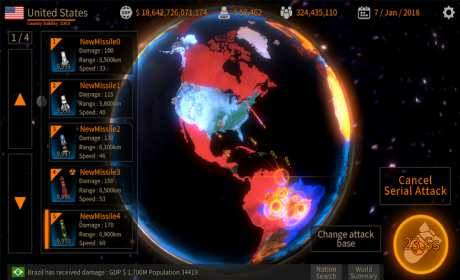 Play with your missiles and strategy to take control of other nations! 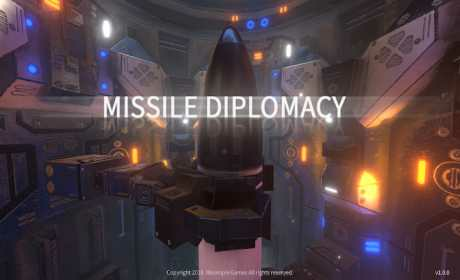 It is the best real-time missile war simulation that can demonstrate your diplomacy skill. 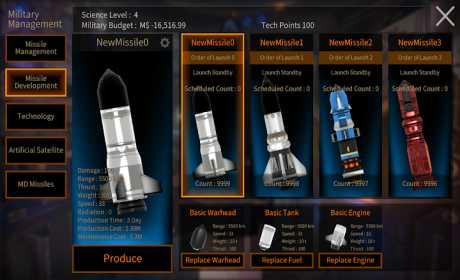 The upgraded version of “Missile war simulator” which ranked Top 6 in paid apps! The goal of the game is to making your country the best in the world. Each country has a “Country Stability” point. If you attack your enemy and set its ‘National Stability’ to 0 (zero), you can take over. As there is a factor ‘friendship’ between countries, maintaining good relations with other countries is also one of the possible strategies. If the player’s country’s ‘National Stability’ goes to 0 (zero), or if the debt reaches the excessive level of defense budget expenditures, player will lose the game. – MD Missile: This is a defense missile intercepting a normal missile. – Science Level : It is a value indicating the level of development of science in the country. – Tech points: Points that you use to improve your technologies. – Satellite: It can check the number of missiles that the enemies possess and it also reduce damage from natural disasters. – Tax: It will increase the available defense budget, but if the tax is too high, the economic growth rate is adversely affected. – Defense budget: It is part of the national budget. It is mainly used in production of missiles. – Overseas Territories: Territories occupied by the player’s country. You can use the “Change Attack Base” button to install missiles in the occupied regions. – The game interface needs to be restarted when changing game language. – If a noticeable frame drop appears, disable the unnecessary effects in the graphic settings.